A newly made report of the first decade of the Udzungwa Ecological Monitoring Centre (2006-2016) has recently been published. Muse together with cooperative Biosphaera and Association Mazingira organize 2-week eco-tourist trips in the Udzungwa Mountains to know the pristine local rainforest, its wonders and the surrounding villages. 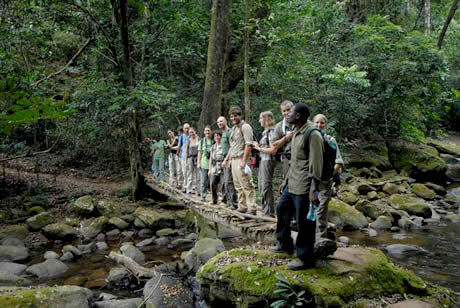 During a period of 4-6 days, the participants can enjoy the outstanding biodiversity, visit the Udzungwa Mountains National Park and its incredible Sanje waterfalls, follow the Sanje mangabey habituated colony of monkeys and climb the 2500 m of the second highest peak of the Udzungwas, Mwanihana, experiencing two fascinating forest nights. If untouched nature is not the only experience people want to try, instead of climbing the montane forest they can choose to visit the activities of the community-based project that Association Mazingira is developing in the area: energy-efficient stoves, tree nurseries, agroforestry, women groups who are producing handcrafts, traditional doctors, environmental education in schools. The exploration of the Udzungwa area will also involve a visit to a rubber plantation and the near forest of Magombera in the Kilombero valley. The trip will continue with an exciting day in the Ruaha National Park, the biggest savannah Park in the South and will end on the white shores of Zanzibar, the beautiful tropical island in front of Tanzania. The trips are planned for December-January 2013 and July-August 2014. The Summer School provides field and GIS tools for assessing forest biodiversity, integrating field techniques, lessons and practical exercises. GIS tools are essential to assess key indicator species as well as for mapping and modeling species distribution. This year the complementary module on terrestrial arthropods will be repeated. The Udzungwa Ecological Monitoring Centre makes an excellent set-up to practically learn the tools to assess and monitor forest biodiversity. The school is organized by MUSE – Trento Science Museum and University of Trento in collaboration with Tanzania National Parks and the Danish Museum of Natural History.